Join EO for this exciting 8-day tour in Greece, with Antioch Baptist Church of Fairfax. Learn about Paul's life and ministry while enjoying visits to Thessaloniki, Corinth, Athens and more. Pricing starts at $3,496* from Washington-Dulles, October 10-17, 2020. Enhance your journey by adding the Greek Isle Cruise extension. *All prices reflect a 4% cash discount price. Follow in the footsteps of Paul and Silas to Amphipolis and explore the ruins of the many Christian basilicas there. In Philippi is a baptismal site commemorating where God opened the heart of Lydia (a seller of purple from Thyatira) to hear the words of Paul (Acts 16:13-15). Lydia and her household were the first Christian converts baptized on European soil. View the Roman-era crypt thought to have served as a prison for the apostle Paul, and explore Philippi’s famous Acropolis, Market Place, the Basilica of Paul, and Theater. Today’s last stop is Neapolis (Kavala), one of Greece’s most picturesque mainland ports where Paul landed with his disciples, Timothy and Silas. See the Roman Aqueduct and Acropolis before returning to Thessaloniki for dinner and overnight. 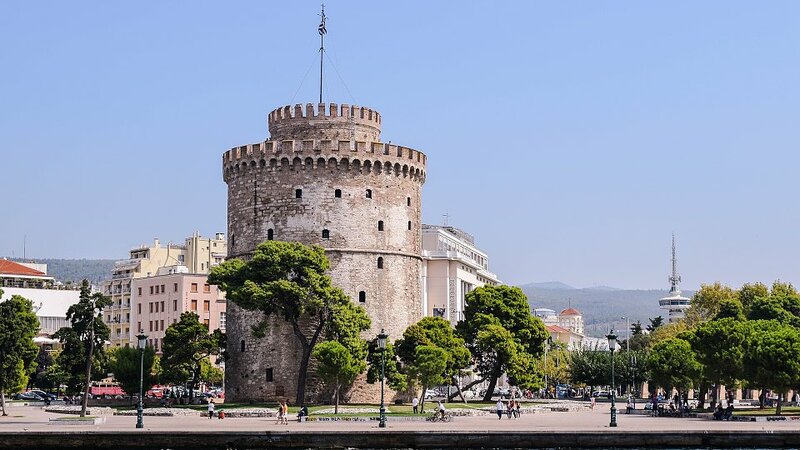 Discover Thessaloniki, where Paul was accused of turning the world upside down with his preaching of Christ (Acts 17: 3-6). As you explore St. George’s Basilica, believed to be built over the synagogue where Paul preached, reflect on the two epistles the apostle Paul wrote to the Thessalonian church here. Stroll through the Archaeological Museum and the beautiful basilicas of St. Sophia and St. Demetrios, dedicated to a distinguished Roman proconsul martyred for his Christian faith. Along the Via Egnatia stands the Galerus Arch, and you can look out over the second largest city in Greece from the Old City Ramparts, some dating back to Roman times. Follow the path of Paul when he fled Thessaloniki for the safety of Veria (Berea), where Jews and some honorable Greeks accepted the new faith (Act 17: 10-12). Continue on to Kalambaka for dinner and overnight. 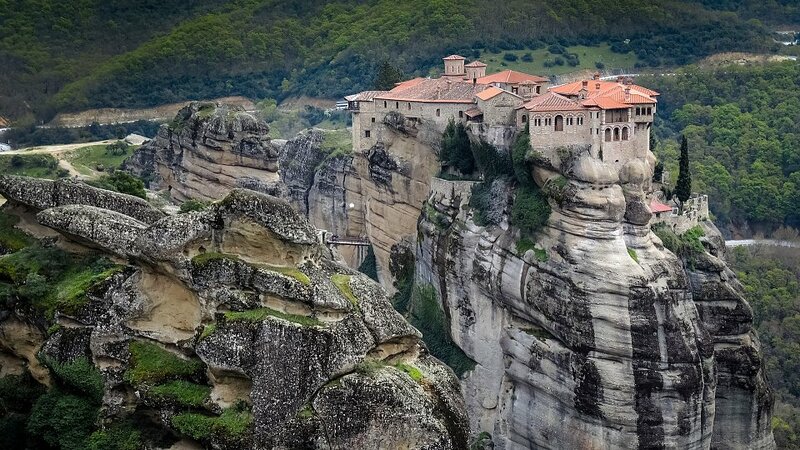 As you visit the rock forest of Meteora (“in the heavens above”) in western Thessaly, imagine the apostle Paul walking that treacherous terrain on his missionary journey. Gaze up at the breathtaking Byzantine monasteries spectacularly perched on soaring, sheer-sided grey sandstone pillars. In the 13th century, monks sought refuge in cliff-side caves before fleeing higher to build the original wooden shelters that later became these monasteries. After a monastery tour, travel to scenic Delphi, religious center of the ancient Greek world and marked by the conical stone called the omphalosor (“navel”). Walk the Sacra Via to the Athenian Treasury, Theatre and the Temple of Apollo, where the oracle performed her prophetic rituals. As you consider the incredible amount of pagan influence just in Delphi alone, you will gain a new appreciation for the tremendous spiritual opposition the apostle Paul faced in preaching the Gospel of Christ here. In the Museum are many ancient treasures, including the 5th century bronzed Charioteer, so detailed you can see his eyelashes. Continue to Athens for overnight. Tour the city of Corinth, where the apostle Paul met fellow tentmakers Aquila and Priscilla and received a vision from the Lord saying, “I am with thee, and no man shall set on thee to hurt thee: for I have much people in this city” (Acts 18: 10). As Paul spoke, Crispus (chief ruler of the synagogue) and many others believed and were baptized (Acts 18:8), establishing the church at Corinth to whom Paul later wrote his two epistles. Discover the Archaeological Museum, Market Place and Temples. As you walk among the ruins, stand on the Bema, where the apostle Paul stood before Gallio to face charges brought against him by the Jews. Stop briefly at the port town of Cenchreae from which Paul later departed for Syria (Acts 18: 12-18). Return to Athens for dinner and overnight. Enjoy the rich architectural splendor of the ancient city of Athens as your guide introduces you to the world renowned Acropolis, the Propylaea, the Parthenon and the Erectheum. Stand on Mars Hill as the apostle Paul did when he proclaimed, “I found an altar with this inscription, TO THE UNKNOWN GOD. Whom therefore ye ignorantly worship, him declare I unto you” (Acts 17:23). As you stroll the Agora (ancient market place and center of Athenian public life), recall that this was where the Apostle Paul preached “Jesus and the resurrection” (Acts 17:18) to the skeptical Athenians. Also see the House of Parliament, the Presidential Palace and the Tomb of the Unknown Soldier. 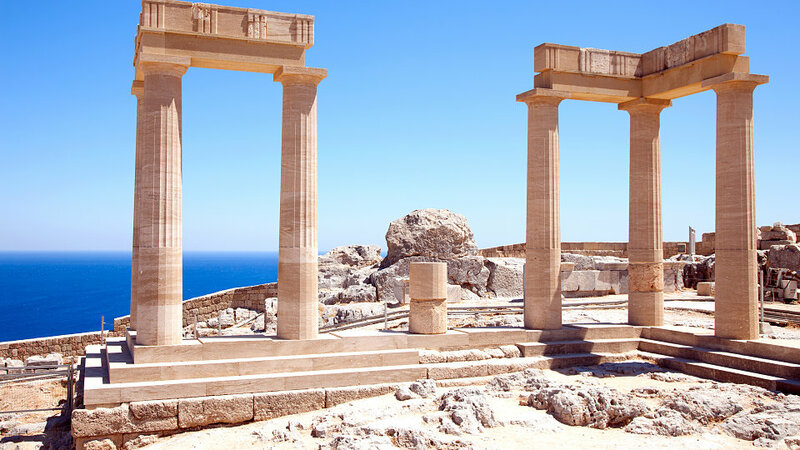 This afternoon is free to explore Athens on your own or enjoy an optional journey to Sounion to visit the famous Temple of Poseidon (additional $75). Dinner and overnight is spent in Athens. Board the ship and sail the blue waters of the Aegean Sea in your Outside cabin (Window). In the evening, you will arrive at the world-famous Greek Island of Mykonos, where gleaming white-washed buildings seem to climb atop each other to reach the azure sky. This morning, you arrive in Kusadasi, Turkey, and journey to Ephesus, where the apostle Paul spent three years of his ministry. He planted a church here and later wrote to them in his Epistle to the Ephesians. Many of the ruins of Ephesus (known as “the marble city”) have been restored to show the city as it was in the apostle Paul’s time. Visit the Agora and imagine where Demetrius the silver-smith, sold his silver shrines of the Greek goddess Artemis. Stroll through the great theater where Paul witnessed faithfully for Christ. Not far away is the stadium where chariot races took place and gladiatorial combats were held. Tradition has it that the Apostle Paul himself fought here against wild beasts. Visit the ruins of St. John’s Basilica, where early Christian tradition tells us the “disciple whom Jesus loved” was buried. View one of the “Seven Wonders of the Ancient World”, the ruins of the Temple of Diana (Artemis) before setting sail for the Island of Patmos to visit the Monastery of St. John, high on the mountain overlooking the entire island. Walk down to the Grotto of the Apocalypse and the caves where it is believed that the exiled Apostle John lived and was inspired by God to write the Book of Revelation as well as other letters to the early church. Dock this morning in Crete’s port of Heraklion, just three miles away from the fantastic ruins of the Palace of Knossos. Discovered in 1899 and partially reconstructed, the elaborate Palace is believed to be the mythical Labyrinth of King Minos and the seat of ancient Minoan culture. Disembark at Santorini, one of the most beautiful of the Greek islands where picturesque whitewashed villages topped with brilliant blue domes stand in stark contrast to the sheer drop cliffs overlooking the Aegean Sea. The island itself perches on the edges of a volcano whose eruption 3,500 years ago is thought to have led to the collapse of the Minoan civilization. Return home with a new appreciation of the Apostle Paul’s life and ministry.